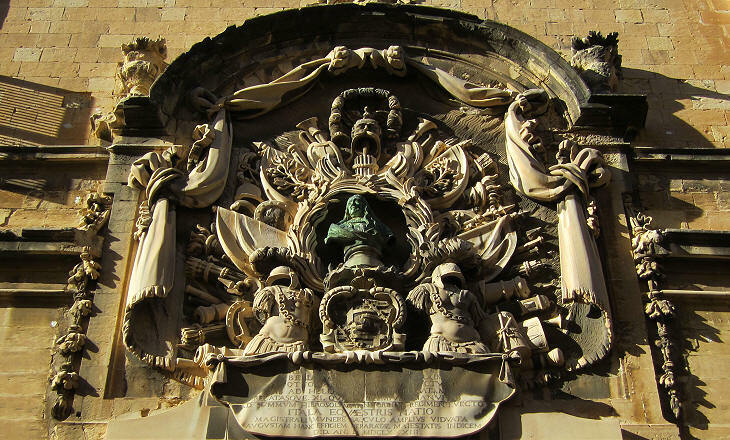 The first stone of Valletta was laid on March 28, 1566. Precedence was given to the construction of imposing fortifications which were designed by Francesco Laparelli, an Italian military architect. The construction of the first churches and palaces of the town was entrusted to Gerolamo Cassar, a Maltese assistant to Laparelli after the latter left the island in 1669. 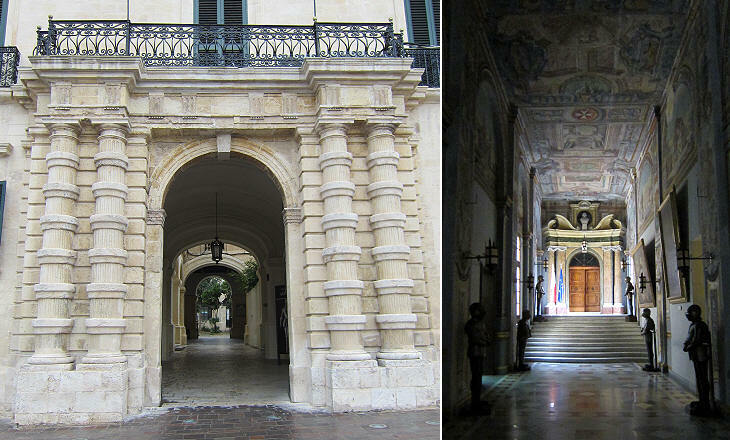 The background of Laparelli and Cassar was military architecture and the portal of the Grand Masters Palace was designed in order to convey a feeling of strength and might. It was located near the right end of the façade; an identical portal was built by Grand Master Pinto in the XVIIIth century at the other end of the façade to provide the building with symmetry. 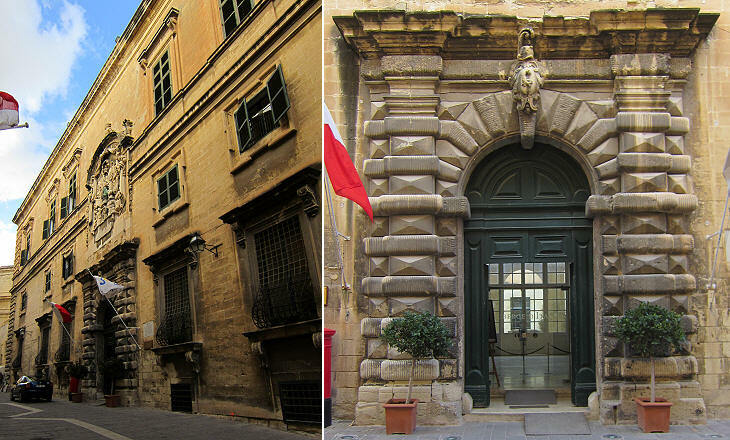 The old portal is utilized by visitors to access the State Rooms open to the public and the Armoury of the palace; the new portal is reserved for the President of Malta and his guests. 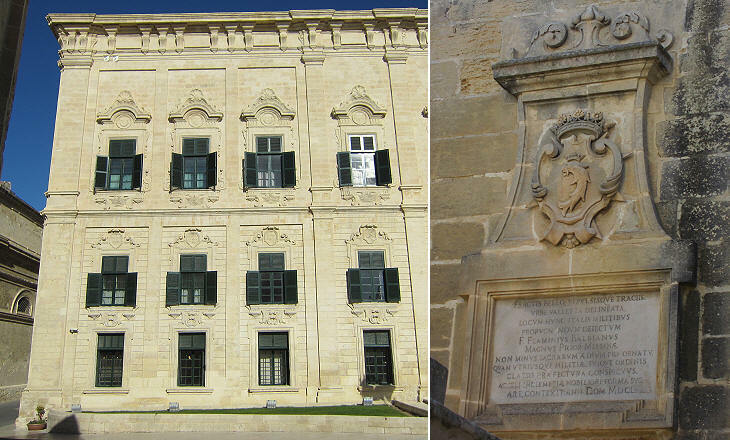 After 1800 the Grand Masters Palace became the residence of the British Governors of Malta. They made some changes to the building, such as the addition of symbols of the United Kingdom, but overall they maintained its character as they regarded themselves as the continuators of the Grand Masters government. 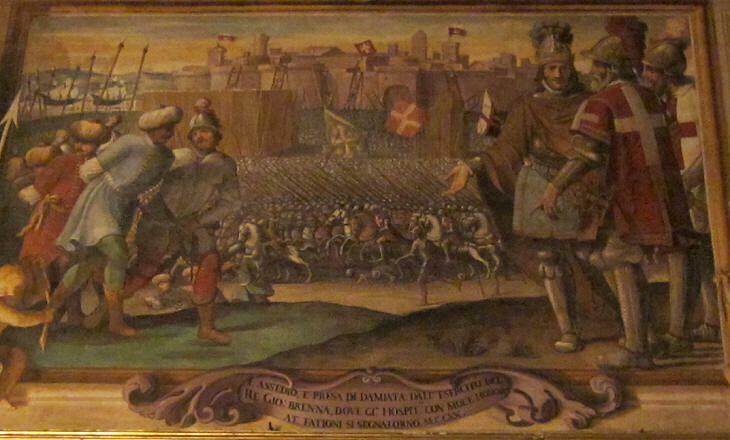 The Sala del Gran Consiglio was used for the official gatherings of the Order and in 1575-81 it was decorated with frescoes depicting the key events of the 1565 Great Siege of Malta; some of these frescoes (The Great Siege of Malta, The Assault on Senglea, The Siege of Borgo, The Fight at the Castile Bastion and The Construction of Valletta) can be seen in other pages of this section. In 1609 Grand Master Alof de Wignacourt commissioned Leonello Spada, a friend of Caravaggio, the decoration of other rooms with frescoes depicting glorious achievements of the Order which occurred when the Knights supported the Crusaders in the Levant. In 1745 Grand Master Pinto commissioned a very elaborate clock having four dials showing the hour, the lunar phase, month and day. 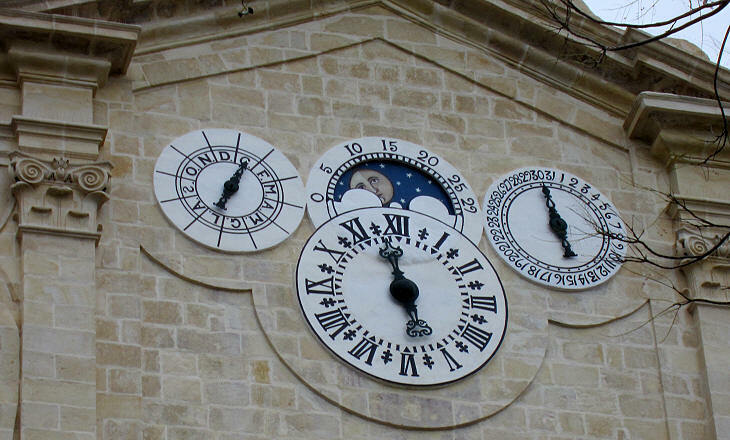 The hour dial suggests that the Knights used the European hour counting system, rather than the Italian one (see an old Italian clock at Sutri). At Rhodes and Borgo the Knights had reserved a section of the town, known as Collachio, to themselves; at Valletta this section was not clearly identified however five of the auberges, the palaces where the knights of each tongue met, were built in the south-western corner of the town between St. James' Cavalier and the Grand Masters Palace. Auberge of Italy was designed in 1574 by Gerolamo Cassar. In 1683 the Auberge of Italy was enlarged by one additional storey; the event was celebrated by placing a gigantic relief housing a bronze bust of Grand Master Carafa. A few years earlier in 1675 Carlo Fontana, a renowned Roman architect, had designed a similar composition to celebrate the completion of Cottonera Lines, a large curtain of new walls built by Grand Master Nicolas Cottoner at Bormla. At Rhodes the auberges were rather austere buildings where the knights lived in compliance with their vows of celibacy, obedience and poverty and their aim of assisting the pilgrims and the sick. At Valletta the military aspect of the Order became the most prominent one and the auberges were turned into elegant palaces as occurred to Auberge of Castile after it was rebuilt by Grand Master Pinto in 1744. By tradition the chief of the Italian tongue was the Admiral of the Maltese fleet; this explains why a fish was the symbol of the tongue. 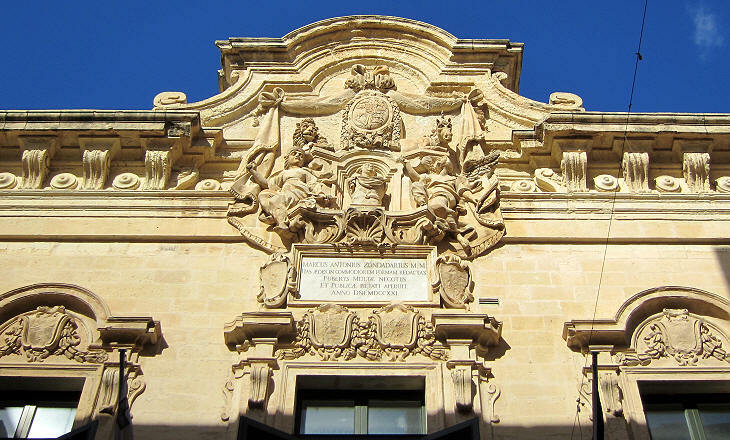 When in 1530 the Knights were given Malta, the administration of the island was entrusted to a governor appointed by the Viceroy of Sicily who was assisted by four giurati, locally elected magistrates who took an oath (Ital. giuramento) at their appointment. The Grand Masters reduced the authorities of these elected magistrates, but they did not abolish them. 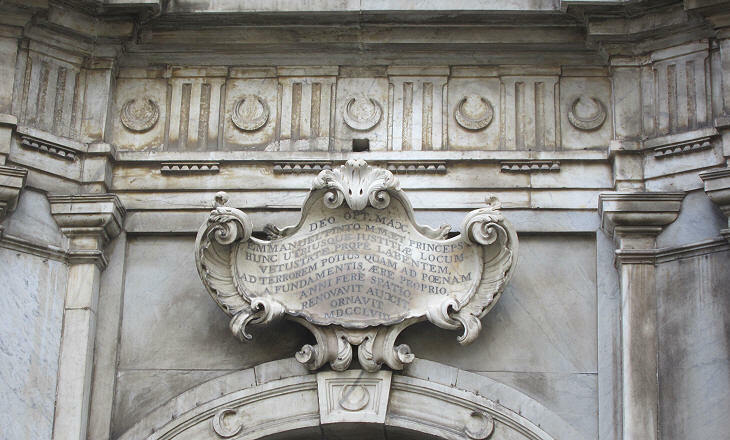 The inscription says that the building served Publicis Melitae Negotiis et Publicae Pietati, so it was something between a Town Hall and a Monte di Pietà, a charitable institution from which people could borrow sums of money by pledging their valuables. 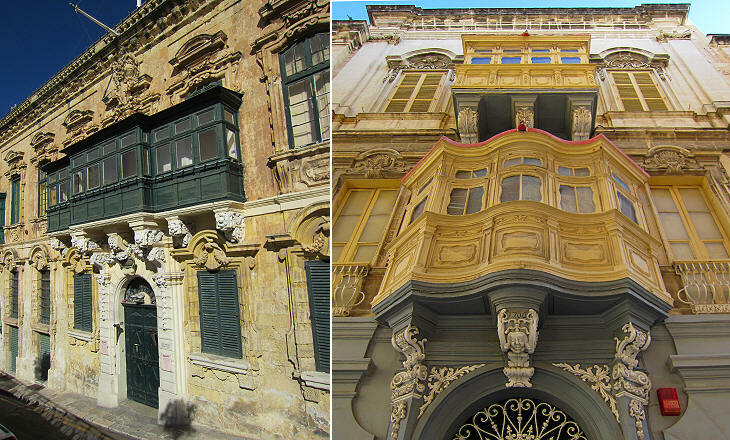 The Knights designated some of the buildings of Valletta with the names they had at Rhodes. The penal and civil court was housed at Castellania, because this was the name of the building having the same function at Rhodes. The jurisdiction of the Grand Master was often challenged by the Bishop of Malta or by the local Inquisitor. In some instances the popes themselves had to intervene to settle these disputes; an inscription at Our Lady of Victories celebrated a papal decision which favoured the Grand Master. 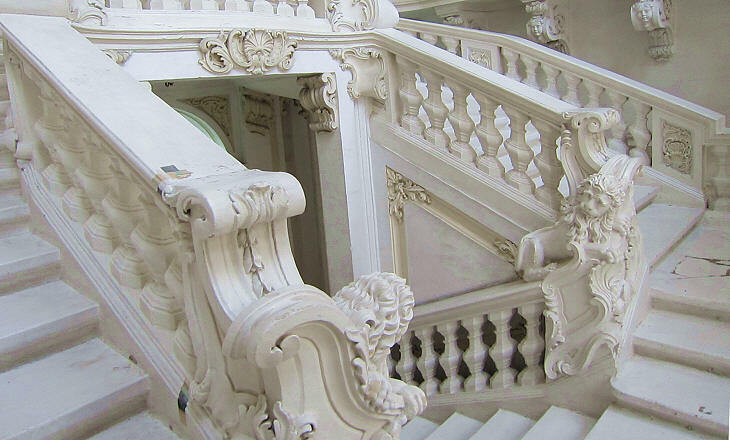 Gallarijas is the Maltese word which indicates the covered balconies which one can see on many residential buildings. They are the equivalent of Ottoman çikmas, windowed projecting parts of houses (see those at Safranbolu). Gallarijas are mainly XVIIIth/XIXth century additions to existing buildings as in the case of Verdelin Palace (or of Palazzo d'Aste in Rome). During the XIXth century new buildings were designed to include gallarijas. The palace built by Fra Ramon de Sousa y Silva, a wealthy Portuguese knight, in ca 1760 shows how much the Knights forgot their poverty vows during the XVIIIth century. 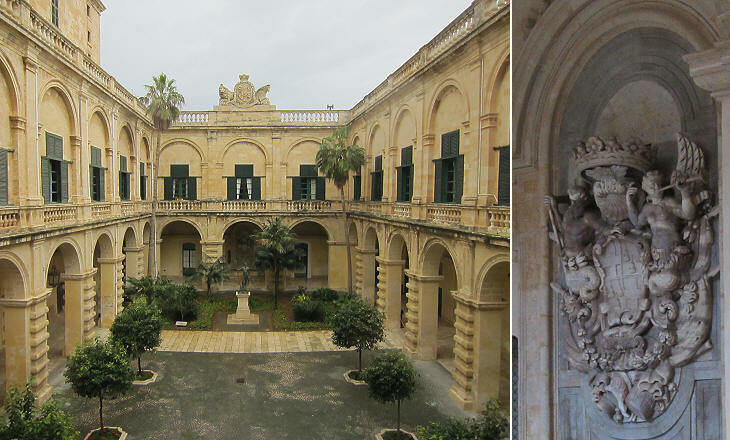 Many of them built palaces in Valletta and villas in the countryside; their number decreased and the defence of the island was more and more entrusted to mercenary troops. When Grand Master Valette decided to build a new town, his engineers verified that groundwater was available in the chosen location. Availability of water was critical in case of a long siege. Deep wells were excavated to reach the groundwater. In 1615 Grand Master Alof de Wignacourt ordered the construction of an aqueduct to provide the inhabitants of Valletta with an easier and wider access to water, but the wells were not dismantled. A large fountain was built near Porta Marina, the (lost) sea gate of Valletta. A bronze statue of Neptune stood at its centre. Some sources attribute it to Giambologna, but it is more likely the work of one of his assistants, maybe Pietro Tacca who almost entirely devoted himself to bronze sculpture (see his works at Piazza della SS. Annunziata in Florence). 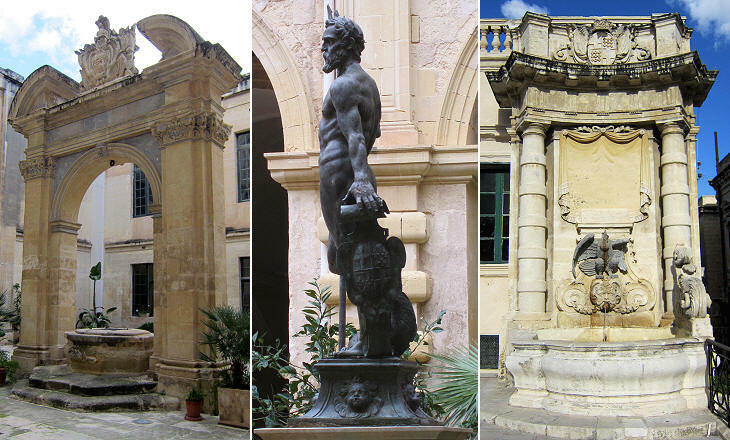 In 1861 the fountain was disassembled; the basin was relocated to Floriana and the statue was placed in the Lower Courtyard of the Grand Masters Palace. The image used as background for this page shows a coat of arms of Grand Master Carafa della Spina at Auberge of Italy.